Apple's plans for its forth-generation iPhone, due this summer, appear to include the addition of a camera flash that will improve the quality of snapshots and videos taken in dark scenarios or dimly-lit venues, AppleInsider has learned. People familiarizing themselves with the first beta of iPhone Software 4.0, released following the conclusion of the company's special media event this morning, say the distribution includes a new framework that will give developers access to a wealth of new camera functions, such as the ability to control white balance and so forth. Additionally, the framework includes three telling new functions labeled AVCaptureDevice.hasFlash, AVCaptureDevice.flashMode, and AVCaptureDevice.hasTorch. The first function appears as if it will check to see if an iPhone, iPod touch or iPad includes a camera flash while the second will activate flash mode. The third appears to be a reference to a flashlight function powered by the camera flash, or a "torch," as it is commonly referred to in the UK. Word that Apple planned to include a flash in it's next-generation iPhone stretch back to January, when I reported that the Cupertino-based company was moving to procure such significant quantities of LED camera flash components that they could only be destined for the iPhone or iPod touch. At the time, people familiar with Apple's initiative said the company was seeking allotments of LED camera flash components in the tens of millions for delivery during the 2010 calendar year, meaning future iPhones. Those same people said that Philips' Lumileds Lighting sector was believed to be the front-runner for Apple's business and may have already secured the design win. A flash isn't the only improvement to the iPhone's camera expected this summer when the new hardware arrives. It's been rumored that OmniVision, the supplier of CMOS image sensors for the iPhone, has secured a deal to supply upwards of 45 million 5-megapixel camera sensors for the next-generation handset. 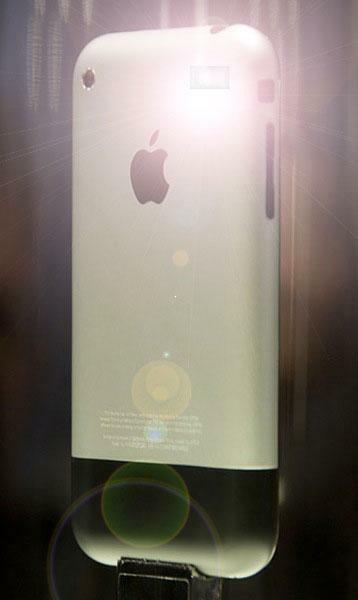 Say cheese: iPhone with flash mockup, source unknown. In making the jump to the iPhone 3GS last spring, Apple was content in focusing on enhancements to the overall user experience of its mobile phone to maintain its high level of satisfaction amongst consumers. Improvements to the device's camera technology were limited to an updated image sensor capable of capturing 1.1 more megapixels, and software technology to improve the quality of motion photos and those taken in poor lighting. Despite these changes, clarity in photos taken indoors and at nighttime continue to elude users, often leading to frustrating results or images that are completely blacked out. A move by Apple to build flash technology into future versions of the iPhone makes more sense now than ever, especially given the increasing popularity of the device as an impulse point-and-shoot camera, as well as rising competition from rival handset makers who count camera flash technology and 5-megapixel sensors on their handsets as an advantage over the iPhone. For example, Palm's Pre, Motorola's Droid and Google's new Nexus One each ship with LED flash technology. And in the case of the the latter two, both include image sensors suited for capturing 5-megapixels compared to the 3.2-megapixel sensor on the iPhone 3GS.